The main character of this story is Rosalie Dumarque, a member of the upper class who’s never left the safety of Wall Rose and cousin of the king. Upon turning 17 she is to be married off to another rich, upper class family for political and monetary advantages just like her sisters before her. Until then Rosalie is free to do whatever she would like. So, naturally, she joins the garrison in order to fulfill her childhood dream of protecting Wall Rose. Actually defending the city is different than Rosalie has expected it to be, but she is determined to show her father – and everyone else – that she is able to fight, no matter what they say. I have some mixed feels on this book. One the one hand, I genuinely enjoyed it. Garrison Girl is a fast read, fun, has some good characters, and I enjoyed the writing style. On the other hand it doesn’t have the same tone as Attack on Titan. But, then again, I’m not sure it has to. I quite liked the prose. The descriptions of the titans brought them to life anew, evoking a real sense of fear. The fear of the garrison soldiers was palpable. The terrifying way the titans move, the way the devour people live, and the smell of them – it is wonderfully immersive in the most frightening of ways. Fighting titans isn’t the only thing the book is about, though. There is a very YA like plot line involving an unwanted arranged marriage, political intrigue, sabotage, a new love interest, and learning how the those who aren’t wealthy live. Rosalie felt very much like a real person in a lot of ways, and is a more complex character than a cursory glance shows. While she wants to prove that she is a fantastic soldier, Rosalie is hesitant to go completely against her father’s wishes. There’s real surprise when Rosalie learns that her fellow soldiers think its odd that she’ll just allow herself to be married off, especially if she doesn’t particularly like her future husband. While running off to the military, at least for a time, was something she considered, this freedom to marry someone of her own choosing is a new concept and something she grapples with. This becomes a theme that runs throughout the book – duty to your family versus duty to the country and protecting its people. If this sounds like it’s up your alley, definitely give this novel a try. Even if you haven’t read or watched Attack on Titan you should be able to follow this novel just fine. It works very, very well as a standalone work and gives a thorough explanation on the city, the military, titans, and the history of this world. However, if this book doesn’t sound like it has much plot or themes in common with Attack on Titan, well, you aren’t exactly wrong. Garrison Girl is very unlike the universe is set in. Attack on Titan is a fantasy, but it is also a post-apocalyptic story. This series is dark, very dark at times. Garrison Girl is at direct odds with this, being much more of a young adult romance than anything else. Fans of the original series might find certain scenes fun. There are, in fact, a number of fight scenes with titans that were very good. The rest of it, though, doesn’t feel like Attack on Titan at all. It’s a rather lighthearted story whose outcome is easily guessed at. Honestly, a lot of fans might not like this books simply because of its tone and themes are so very different than the series they’ve come to love. Honestly, I feared I’d fall into the group when I begin the book. It was different and I wasn’t sure how I felt about it. Yet, the book’s tone had a familiar feel and it took near to the end for me to place it properly. Fanfiction. The book felt like the best, most highly read fanfiction I’d ever read. Don’t take this negatively. I love fanfiction and think it’s a very important part of fandoms and extremely helpful in honing writing skills. If you enjoy reading Attack on Titan fanfiction you will adore Garrison Girl. The last thing I want to touch on is the quality of the book itself. I’ll be honest, this is a very beautiful book. The page layouts work very well. New chapter headings look absolutely gorgeous. The map of the walls is located in the front of the novel as is the familiar human to titan height measurments. It’s the sort of book you want to have on your shelf just to make the collection complete and because it looks so beautiful. 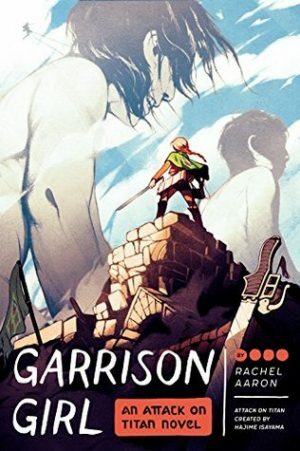 It took me a while to figure out how I felt about Garrison Girl: An Attack on Titan Novel by Rachel Aaron. Honestly? I’m glad I read it. It was a good book to read before falling asleep, and I enjoyed myself. And what more can you ask for from a book? That said, if you like Attack on Titan for the gritty battles, blood and guts, dark themes, and post-apocalyptic feel, this may not be the spin off you’re looking for.